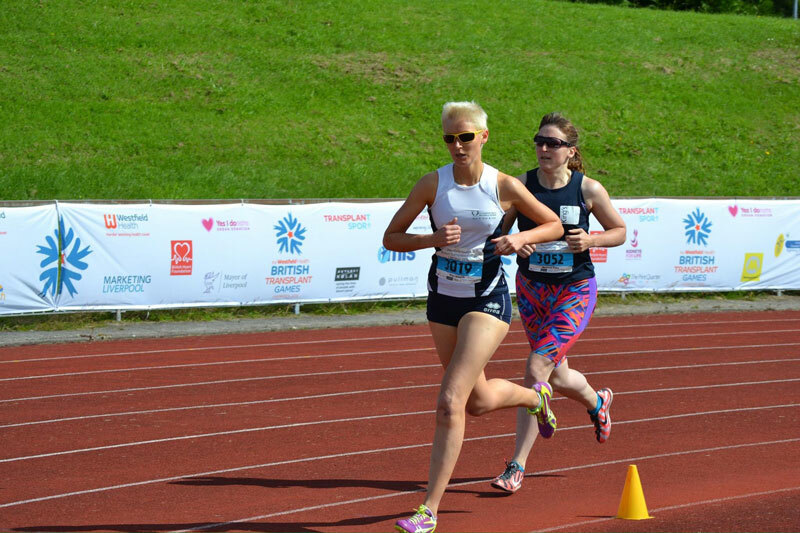 Two weekends ago I travelled up to Liverpool to compete in my fourth British Transplant Games for King’s College Hospital, the hospital where I had my bone marrow transplant seven years ago. 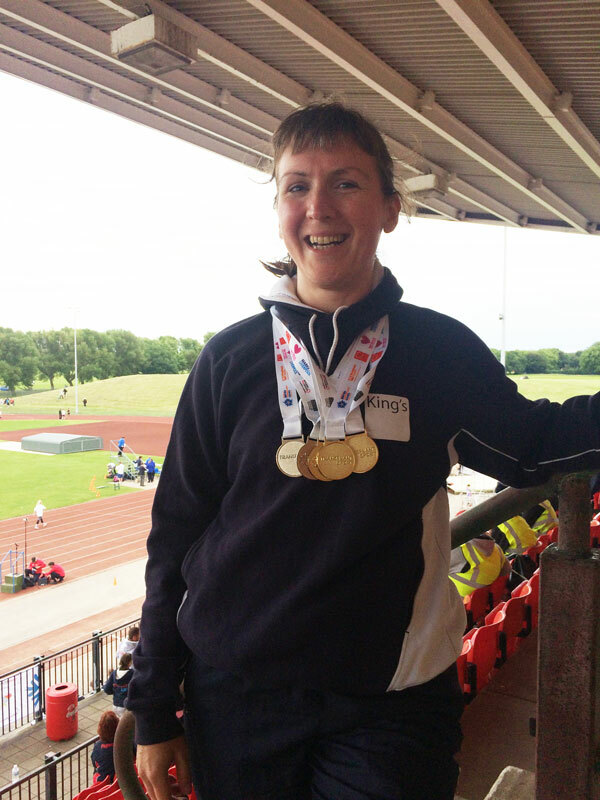 The Transplant Games are open to bone marrow and organ transplantees of any age, in a wide variety of sports and activities, and it truly is such an inspiring weekend of sport, community, and the life-saving power of transplants. In years past I’ve done dedicated track and speedwork in preparation for the games, but this year has just been so… disrupted (between being ill for Jan-Mar, then going straight into marathon training for Transylvania then straight into distance cycling for Dunwich…) that I didn’t get a chance to do any speedwork. I did finally get on the track two days before the Games, but prior to that, the last time I set foot on a track was in Argentina!! So I was really not feeling prepared this year, and just approaching it as a benchmark, and if I won some medals, fine. But my heart wasn’t really in it, and I kinda felt like I was just going through the motions, if I’m honest. I was most looking forward to seeing so many friends from around the country that I only see once a year! My first event is always the Mini Marathon on Saturday night. It’s 5km for men, and 3km for women (don’t even get me started!! ), either on roads or park paths somewhere in the host city, and this year it was a simple out & back route along the docks in Liverpool, which was nice. 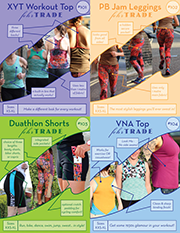 The Donor Run takes place at the same time, and is open to the public, but to avoid a dangerous scrum with serious competitors getting tangled up in fun runners in tutus (see Bolton in 2014), the transplant athletes set off from the front, with separate Donor Run waves behind. Immediately from the starting gun there was a lady that was quite a way in front of me – I’d never seen her before, but I couldn’t close the gap at all, and mentally I’d already started thinking “oh well, I guess I’m not taking my [1st lady] trophy back home this year, but she looks younger so maybe I’ll still get gold for the 30-39 age category…” which made me not push quite as hard. Then I heard a spectator shout “Go Nadia!” and realised that she wasn’t far behind and I couldn’t quite give up yet, so I pulled up my socks (metaphorically) and kept pushing until I was over the line. So no one was more surprised than me to hear the words “Congratulations, first lady!” – turns out the lady who went off like a shot wasn’t a transplant athlete but was a fun runner doing the 5k who just pushed her way up with the transplantees to be at the front! So thank you, speedy lady, as you definitely made me run harder than I would’ve otherwise! The second surprising thing said to me as I crossed the line was “As first lady, you get to release the doves!” RELEASE THE DOVES?!? This was definitely a first for me! I’ve never been asked to release doves before! But yes, the first 3km male finisher and I opened the basket and… actually they were quite content to sit in there until we gave them a little prompting and they flew away! With the Mini Marathon out of the way, I felt a bit more relaxed and able to enjoy the King’s team meal afterwards on Saturday night, ready for the shorter track races, which are all on the Sunday – yes, five track races in one day! The 1500m is my favourite of the track races – not just because I’m a distance runner and it’s the longest, but because you get to employ some tactics and mind games. I find with the shorter races a lot of it is just technique and brute strength, and I personally like not having to stay in lane, too! Last year was the first year that I’ve had the chance to race against my “nemesis”, Orla, but she was coming off a foot injury last year and wasn’t at peak performance. With me not at my best this year, it was always going to make for an interesting race! With the 1500m, you’ve got a few options when it comes to the lane – naturally, you want to gravitate to Lane 1 since it’s the shortest distance, but this can mean that you get trapped in when there are several runners in a pack. But since it was just me and Orla up at the front, I chose to run on her shoulder in Lane 2, making sure she knew I was there and she couldn’t take it easy, even though it meant I was running further on the curves. I usually like to turn the screw and up the pace in the third lap, but this year I upped the pace, but she matched it and I just couldn’t get around her. 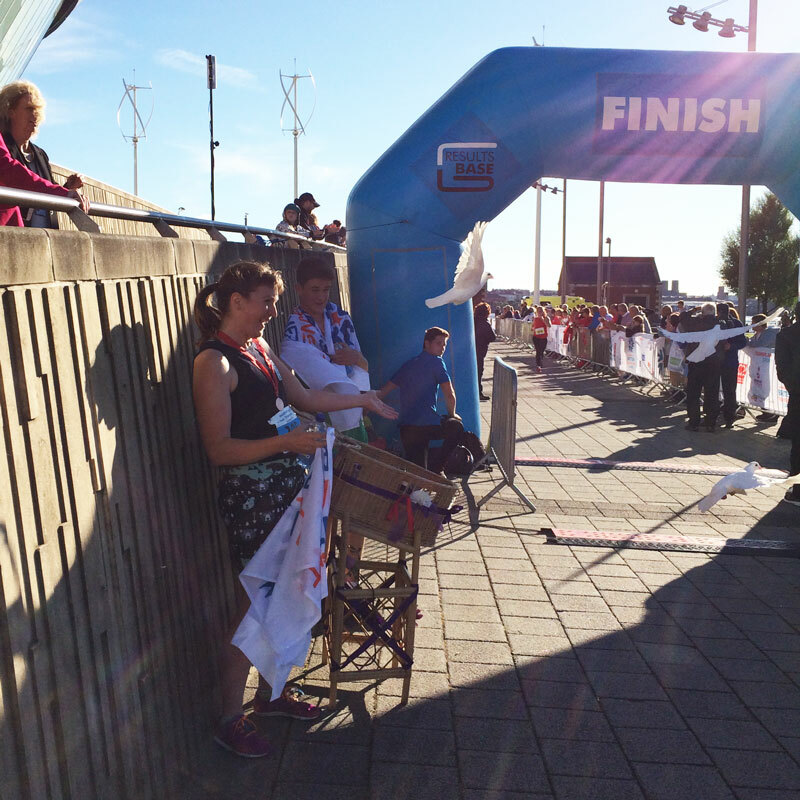 So I stayed with her and played the only card I had left – the sprint finish. 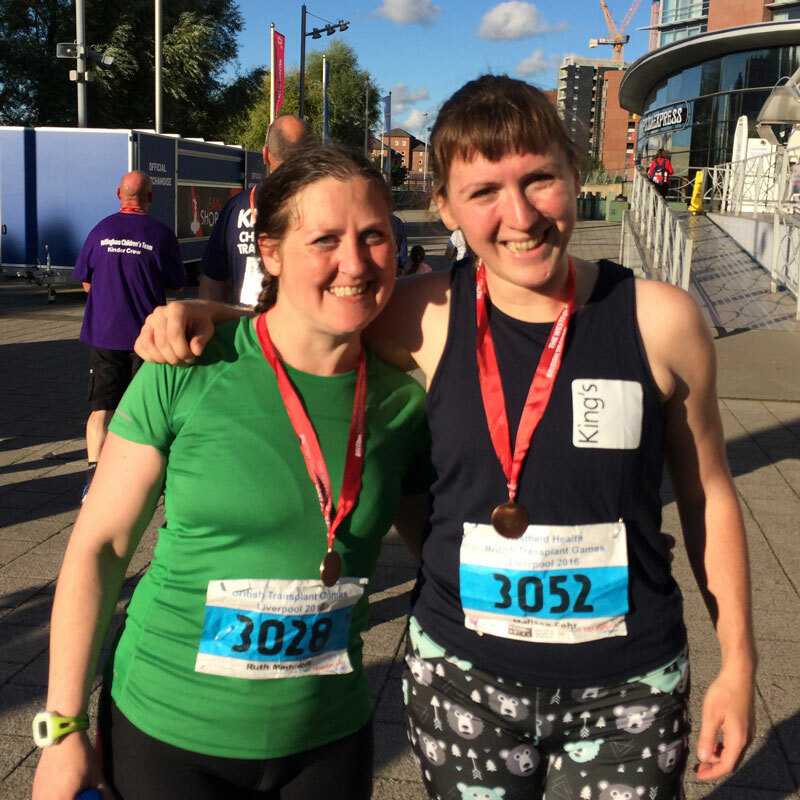 Now, for all my medals and trophies and marathon times, I am terrible at sprint finishes – I always get left for dead at Run dem Crew when we sprint it home, and I didn’t really want to leave it to a risky finish. But since it was the only option I had left, as we rounded into the last 100m, I gave everything I could and hoped she wouldn’t notice until it was too late – and by some luck, that’s exactly what happened! Had she noticed earlier how much I’d cranked up the speed, I know she could’ve won it, but it was the surprise I needed to cross over the line just ahead, taking gold and giving the crowd a great show, too. I had a few hours break before my next race (thankfully!) 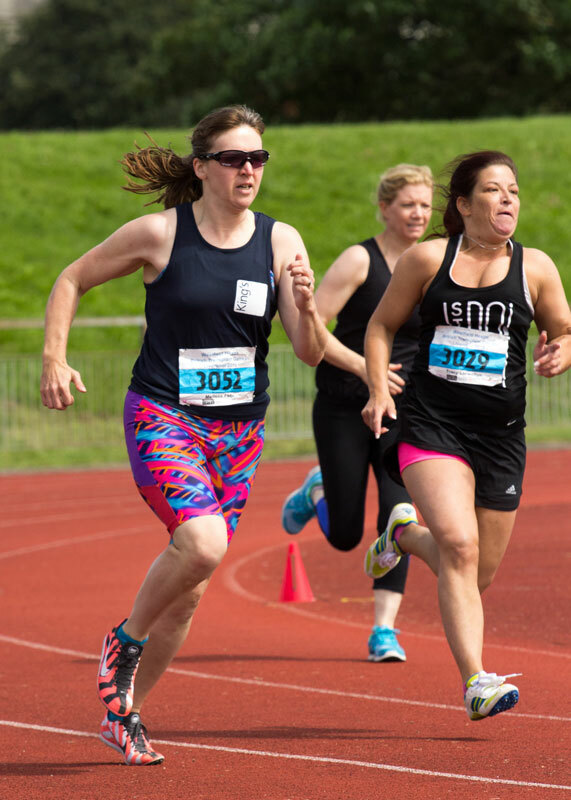 but the 200m is my least favourite distance – it’s my weakest event (I don’t even do it at the World Transplant Games) and oftentimes the fast 100m sprinter ladies come up to run it, with them in blocks and me just trying to hold on. And it absolutely wrecks me for the rest of the day, moreso than the longer races. But I’d promised my team captain I’d do it if it was a guaranteed medal (and therefore points for King’s) so I asked the officials for the starting list and… there were just three of us in my 30-39 age category, so it looked like I was running it! I didn’t know the other two ladies but I assumed this was because they were sprinters so I’d mentally resigned myself to bronze, but to my astonishment, I’d ended up crossing the line first for a gold! Even stranger is that I raced it in the exact same time as last year, but it got me the gold instead of the bronze, which goes to show that it’s as much about your opponents as it is your performance sometimes. I had about an hour break before my next race, and for some reason there were loads of women in my age category signed up for the 400m, enough that they had to schedule two separate time trials! As it turned out, there were a few no-shows so they managed to squeeze us all into one final, but I’d be up against Orla and I knew this was not only her strongest event, but also that she’d run half as many races as me in the past 24 hours. I pushed it hard, but Orla came round in an inside lane and took the lead and maintained it, thoroughly deserving her gold and leaving me with the silver. Which, looking at the strong finishes from across the other 8 lanes, is no mean feat in itself. 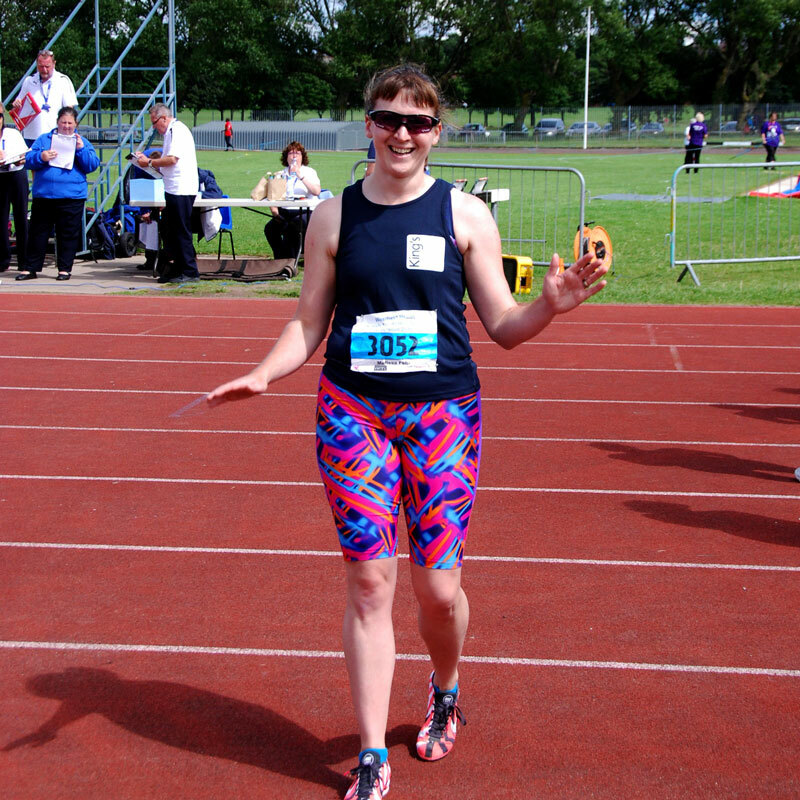 And, no less than a half hour after the 400m (literally not even enough time to get my medal), I got to do it all over again… twice around! There weren’t as many of us on the starting line as the 400m, but frankly I was knackered. 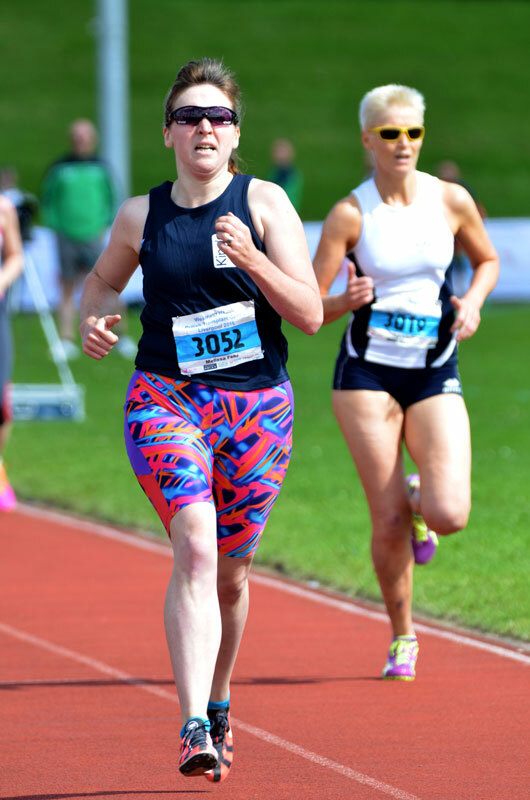 So when Orla took off like a shot I thought “There is no way she can maintain that pace for the whole 800m” and resolved to keep steadily at it and close the distance over the two laps. But respect to her, she did maintain that pace, and I never did manage to close that gap. But I kept true to myself, too, and maintained my pace, earning myself a second silver for my collection! It wasn’t until afterwards that I compared my times to previous years, and it was interesting to note how consistent my times were compared to previous British Games (where I’d been equally knackered at the end of the day – my Argentina times were way faster thanks to the extra training and rest days!). My 800m time was actually 2 seconds faster than last year’s time, and my 400m was 1 second faster, so again, it’s really down to your competitors as much as it is your own times! And again, I had less than a half hour’s rest before the final event of the day, which is always the team 4×100 relays. Now, I always put my name down in advance to help out the team, but I always try to wriggle out of actually doing it because a) I’m freaking exhausted at this point of the day, b) I am not a sprinter and hate competing the 100m distance, and c) oh god the baton and the little lines and I can only hand off within certain lines, aaahhh! But we’d had some injuries this year and so a few regulars couldn’t do it, and I agreed to run it if I could be in the first position and therefore only have to do one baton handoff, ha! There were so many teams competing this year that they had to run three separate heats (as time trials) to decide the winners, and Team King’s did amazingly well – coming second place in the first heat so we then had a nail-biting wait watching the other two heats hoping we’d be fast enough to cling on to a silver or bronze. As it turned out, we were awarded silver on the podium, but after some protests that the winning team was comprised of athletes from mixed hospitals and therefore ineligible for medals, we were eventually awarded gold!! In all my years for competing for King’s, we’ve never won gold at the relay so this was a huge deal for us, and completely unexpected! So all in all, I ended up with four golds, two silvers, and the right to retain my trophy for another year. Not bad for feeling woefully unprepared, especially if you consider that, in June and July, I’ve run an (ultra) marathon through Transylvania, cycled 120 miles overnight, and won medals in six separate track events! Which is quite a range. Can’t wait to see you in action in Malaga! You always inspire me!